*According to EPAâ€™s 2003 Assessment of Risks from Radon in Homes (EPA 402-R-03-003). Radon is a radiocative gas You canâ€™t see radon. And you canâ€™t smell it or taste it. But it may be a problem in your home. Radon is estimated to cause many thousands of deaths each year. Thatâ€™s because when you breathe air containing radon, you can get lung cancer. 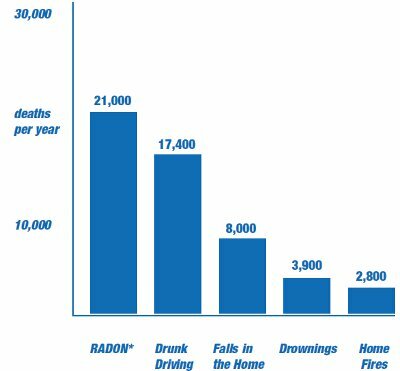 In fact, the Surgeon General has warned that radon is the second leading cause of lung cancer in the United States today. Only smoking causes more lung cancer deaths. If you smoke and your home has high radon levels, your risk of lung cancer is especially high.